Why should the audience watch the aerobic competitions during the championship series? The aerobic competition will be filled with energy, excitement and dynamic routines. With the routines being performed to upbeat music at high intensity and speed it will definitely impress and be an exciting championship for the audience to watch. What should people be looking out for, what makes a good routine? A good routine will consist of excellent technique and one which is cleanly executed with a variety of movements. As well as good synchronisation and interactions being performed in groups, trios and mixed pairs. Why is aerobics so special to you, why do you love it? It’s been part of my life for eleven years now, and I have loved every second of it. The excitement of competitions, hard work in the training room and challenging myself to be best I can be never fails to disappoint me. I thoroughly enjoy every part of what it takes to be an aerobic gymnast. Can you name a couple of move/ skills people should look out for and explain what they are? One skill to look out for is a Moldovan. As the body turns, the hands tand legs will change from straddle to L support back to straddle support every half turn. Helicopter to wenson is a skill where leg circles are formed on the upper back close to the chest. The legs are then extended upwards and forwards initiating a half twist to land in wenson push up. A wenson push up is front support with one extended leg supported on the upper part of the triceps. Also in every routine you will notice the combination of aerobic basic steps with arm movements. The basic steps include Jack, knee, lunge, kick, step, march and jog. What does it take to be a top aerobic gymnast? To be top in any sport you need to have the desire to be the best you can be, desire along with dedication will show results. You have to be determined and willing to put everything you have into every single session, hard work and pushing yourself to the limits. As reigning champion how excited are you to try and retain your title and compete in Liverpool? I am really looking forward to competing in Liverpool, I think the atmosphere is going to be amazing in the echo arena. I am excited for the challenging competition in the senior category and I am looking forward to fighting for the title. 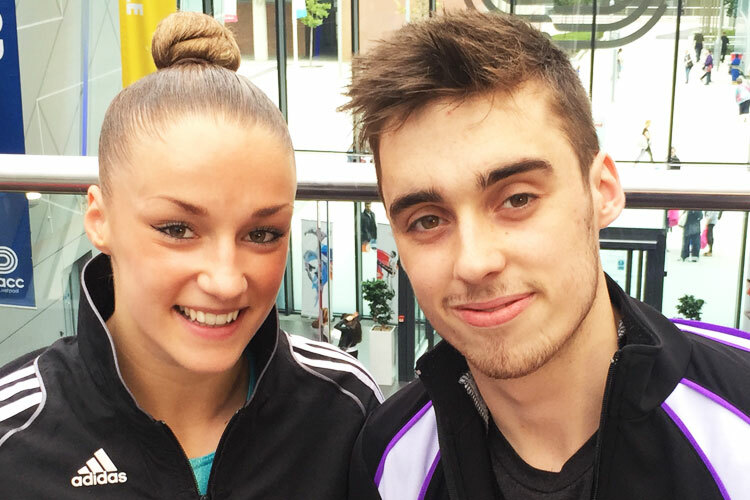 Get your tickets now for the 2015 British Gymnastics Championship Series.